Are you are looking for a really special Christmas present for a friend or loved one? If they are interested in aromatherapy then your search may be over. 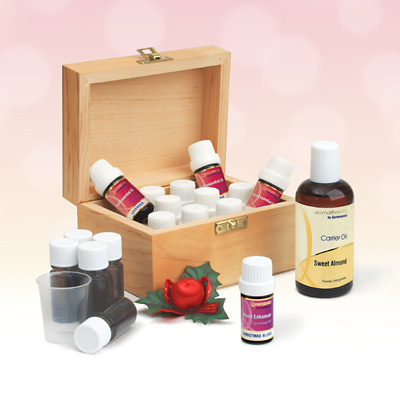 Right now you can receive 15% off this fantastic Aromatherapy Starter Kit that includes a great selection of the most versatile and useful items. And there's more. To help you create a cheery festive atmosphere in your home this Christmas you will also receive a 5ml bottle of our hugely popular Xmas Blend Mood Enhancer with our complements! The attractive hand-made storage box is made of Alder wood and has a natural satin finish that will accessorise and blend perfectly in your bathroom or bedroom etc. Featuring a handy brass clasp, this useful Storage Box will hold 12 x 5ml or 10ml bottles of essential oils, protecting them from heat and sunlight thereby keeping them in perfect condition. But you need to hurry - because this year we only have 80 Starter Kits we can supply with this discount, and when they are gone the offer will close. Order your Aromatherapy Starter Kit today, enjoy a massive saving of over 15% off the regular price - and claim your FREE bottle of Christmas Blend Mood Enhancer before they are all gone!